On June 17 during Global Garbage Man Day, the nation and the world takes time to recognize the dedicated efforts of the men and women who keep our communities clean. We describe the experts who collect the garbage, recyclables and castoffs from our homes and neighborhoods by several names. Whether they are the sanitation specialists or waste management professionals, we appreciate their arrival on a regularly scheduled basis. The role of waste management goes far beyond garbage collection. In each community, they provide a variety of services and programs designed to protect and reduce the impact we have on our environment. Global Garbage Man Day celebrates the great strides the industry and the experts are taking to make a better world for all of us. Thank your garbage men and women. Take part in your local recycling programs. Learn more about your community’s sanitation needs and find out how the system works. Use #GarbageManDay to share on social media. 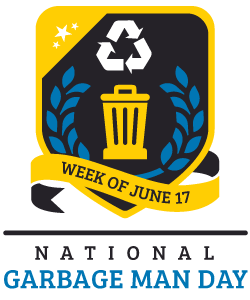 John D. Arwood founded National Garbage Man Day in 2011 to honor the men and women working hard in the industry to keep communities safe and clean. Recognizing efforts around the world, the celebration became Global Garbage Man Day.